The school staff, however, said it was a cleanliness drive and everybody, including teachers, participated in it. DAMOH: Students of a government-run primary school at a village here were allegedly made to clean a toilet using their mid-day meal utensils, prompting the district authorities to order an inquiry into the incident. The school staff has, however, denied the allegation. 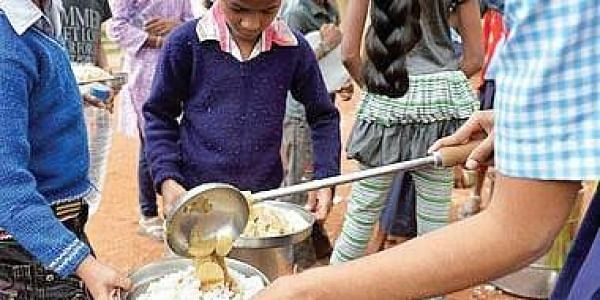 A group of parents yesterday reached the school at Doli village after their children complained that on Wednesday they were allegedly asked to clean the toilet using the utensils (thali) in which they were served their mid-day meal. One of the parents, Guddu Kushwaha, alleged that his daughter complained she was asked by the teachers to dispose of the human excreta in the toilet by using the mid-day meal plate. "After returning from school, my daughter told me that she and other students were told to clean the waste (human excreta) in the toilet with the mid-day meal dishes (thalis). The school was closed when we reached to complain on Wednesday evening. We went there yesterday and complained against the incident," Kushwaha said. While denying the allegations, a teacher, Rakesh Tantawai, said there was nothing wrong with the cleanliness campaign. The school has only one toilet and there is no question of cleaning the waste, he said. District Collector Shriniwas Sharma ordered an inquiry into the incident. "I have told the district project coordinator (DPC) of Sarv Shiksha Abhiyan to conduct an investigation. A team of officials was also sent for investigation today," he said. DPC Hemant Kherwal said, "As soon as I got the information, I immediately directed the block resource officer (BRC) to investigate the allegation. So far, the officials have not confirmed such an incident. I will be able to tell only after the submission of the inquiry report." Meanwhile, BRC, Janpad Shiksha Kendra, Hatta, T R Karpentar said he had sent other officials for an inquiry but the report was not satisfactory as the statements of the parents were not recorded properly. "I would myself visit the school to conduct an inquiry into the incident," he added.